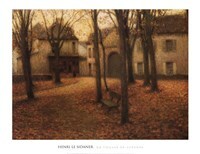 Henri Le Sidaner spent his early years with his family in the West Indies before they returned to their native France in 1872. He first studied art with the history painter Alexandre Desmit in 1877 and then, beginning in 1882, with artist Alexandre Cabanel at the Ecole des Beaux-Arts in Paris. While at the Ecole, Le Sidaner often retreated to Etaples on the northern coast of France, where he felt released from the Ecole's strict routine of copying art in the Louvre Museum. 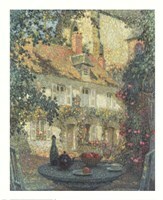 In 1887 Le Sidaner's figurative paintings set in Etaples were exhibited at the Salon des Artistes Français. They were well received, and by 1891 the Salon had awarded him a bronze medal and trips to Italy and Holland. After the turn of the last century, Le Sidaner turned from figurative painting to landscapes, gardens and interiors. He became well known for his moody scenes of urban and rural houses bathed in twilight and moonlight, undisturbed by human figures. He also painted scenes from his own home and gardens, also devoid of human figures, though a set table or an open book often implied a human presence. Le Sidaner's art was quite popular, and by 1897 he exhibited regularly in one-man shows in Paris, London, Brussels and the United States. In 1930 he was knighted with the Legion d'Honneur and elected a member of the Academie des Beaux-Arts.